After the abundance of citrus in our lives these past four months, it is hard to believe that in a week or so, there will be no more until next December. 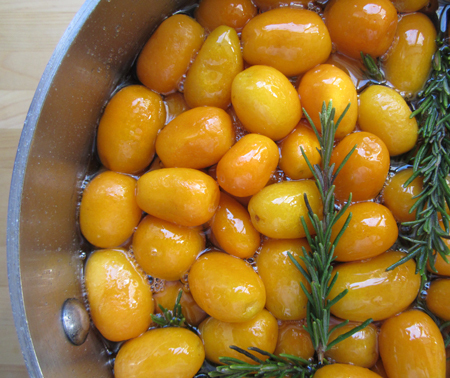 Today, using the last ones of the season, we are making candied rosemary kumquats. My question is: are kumquats citrus or not? I had heard tell that they are not a citrus. Yet our miniature kumquat tree looks like a citrus tree. The leaves are identical to other citrus. The blossoms smell like a citrus. The fruits look like a citrus. They even taste like a citrus. So will somebody please tell me why they might not be a citrus?? It is a good thing that I have a live-in, personal horticulturalist to tell me. (He is very closely related to my live-in, personal encyclopedia.) Apparently, in the 1780s, Carl Thunberg (any relation to the floriferous vine thunbergia?) first classified them under citrus japonica in his book The Flora of Japan. And that was that. Well, not so fast amigo! In 1915, USDA botanist Walter Swingle (who introduced dates and pistachios to American agriculture, and developed the tangelo) reclassified them under the genus fortunella, and said they were not a citrus. Huh? Happily, they are back in citrusdom (citrus japonica) thanks to a book called The Flora of China. This makes a vague and humorous sense as westerners first encountered kumquats in China at a time when westerners had a vague concept of Asian geography and often lumped China and Japan into India! That, of course, begs the question: why don't we see more kumquats in Chinese cuisine? Although native to China, they have been grown there and in Japan for centuries. From the Chinese words, Chin Kan (meaning golden and orange), these tart sweet golden nuggets were a tasty treat for us when I was a kid. Not right off the tree, mind you, but candied and in a relish tray at the holidays. Recently, I saw a recipe in the New York Times for candied kumquats and it brought back a flood of Christmastime memories ... jars of sweet, syrupy kumquats spooned into a section of the pewter tray next to candied apples and corn relish. Never one to leave well enough alone, I added my own touch to the recipe with some rosemary. Candied, they are really delicious by themselves, and also as an accompaniment to any main course. We had them with roasted chicken the other night. And there is a bonus product, too! 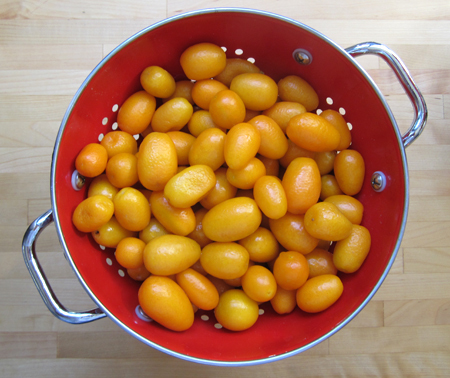 There will be leftover kumquat-rosemary syrup that is great on pancakes, waffles or French toast! How about in a cocktail? Or for brushing over the top of a cake? Kumquats. In the end, if they taste good, who cares if they are citrus or not? Right? In a large saucepan, cover the fruit with cold water and bring to a boil. Drain. Cover the fruit with cold water and bring to a boil again. Drain and set aside. In the same saucepan, combine the water and sugar, bring to a boil, reduce heat and simmer for 10 minutes. 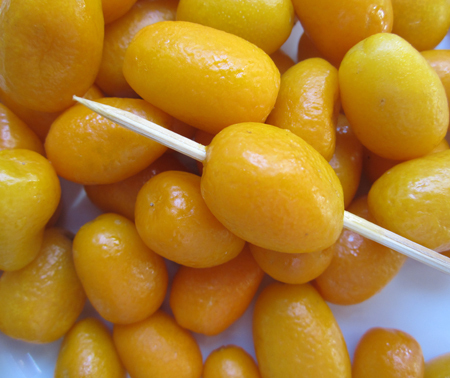 Pierce each kumquat all the way through with a wooden skewer. Drop the fruit and the 4 untrimmed rosemary sprigs into the sugar syrup and continue to simmer for 15 minutes. Bring the syrup and fruit to a boil, then reduce to a simmer for 10 minutes. 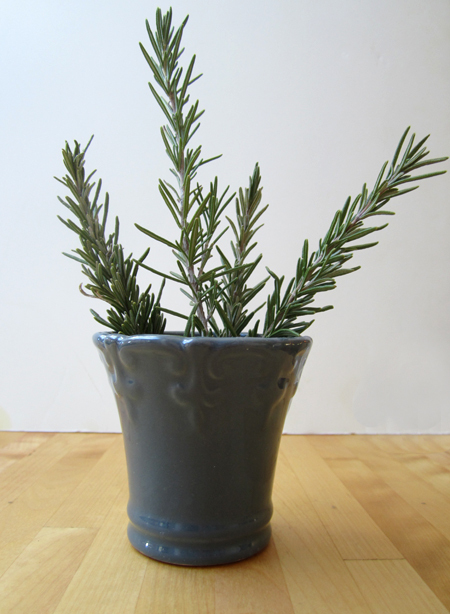 Remove the rosemary sprigs and replace with the 4 trimmed ones. 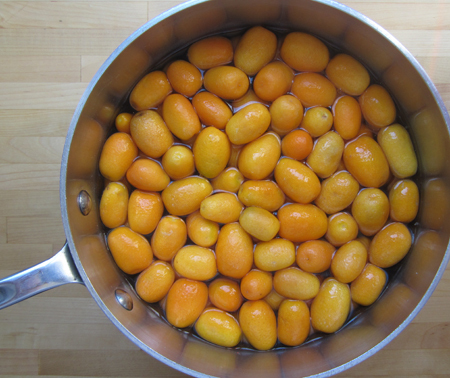 Let new sprigs simmer with the kumquats for 1 minute. 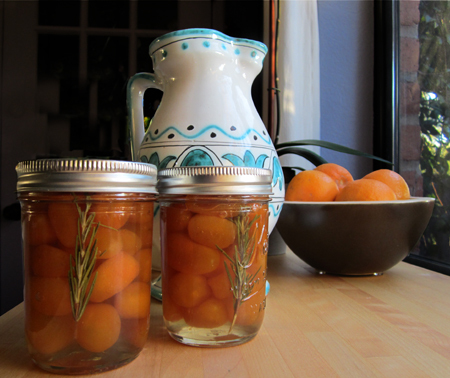 Using a slotted spoon, divide kumquats among 4 sterilized half-pint jars. Tuck the rosemary sprigs into one side and top the kumquats with hot syrup. Seal and process for 10 minutes in boiling water. I´m one of those persons who LOVES kumquats so much, I don´t candy them anymore because I can eat pounds of it in a few days. And I had two friends who have trees, so they gave my bags full of them. I used to pop them like candy straight from the tree when I was a kid, since it grew a lot in my family´s farm. I had a recipe for lamb with candied kumquats that was amazing. And it would be good with the rosemary version too. I will get a bunch next time they´re in season! Paula - our new passion is mandarinquats! They are nice and tart inside and the skin is super sweet on the outside. 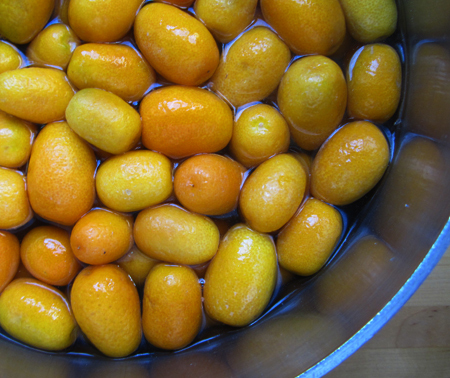 We eat most of our kumquats un-candied, and save the candied ones for special occasions. The lamb dish sounds amazing - I will have to look for it! David - every time I visit your blog I know I'll find something wonderful but this made my mouth water. 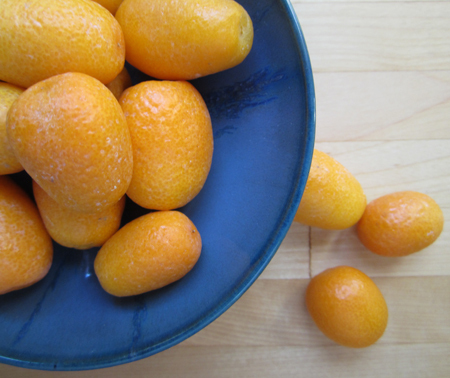 I adore kumquats and we used to candy them growing up as well, so I have fond memories. Love this and will definitely be trying it out. I love this post! So informative and evocative--I think the scent of citrus and rosemary is wafting out from my mother's kitchen as I look at the photos and read the recipe! 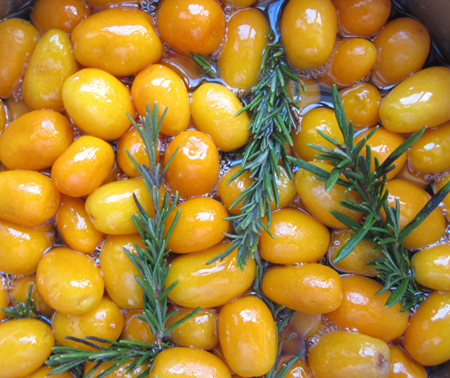 I also think Paula's lamb recipe with your rosemary candied kumquates sounds terrific! Finally, love the photos! Thank you and the horticulturalist (who doubles as an encyclopedia)! 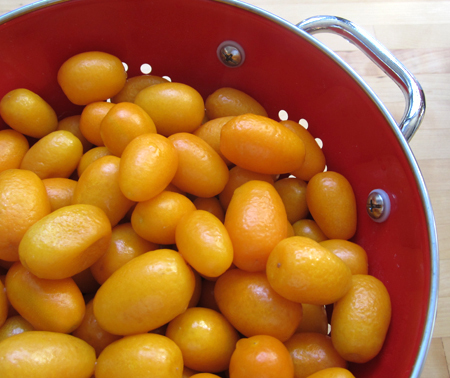 I love kumquats and your recipe is such a great way of preserving the season. Thanks for sharing. I'm going to see if there are any left at my local store. I have to be truly honest I've never tried a kumquat! They look like little oranges to me so I would class them as citrus and hopfuly I might just be able to find some for this recipe. I have to agree that the syrup would taste delicious on waffles too. Ahu - the most amazing thing about this post has been finding out how many people love to eat kumquats just as a snack! I love that! I know, Susan, we need to get Paula's recipe soon! Glad you enjoyed the post and photos! Hello Spice Foodie - welcome to C&L! 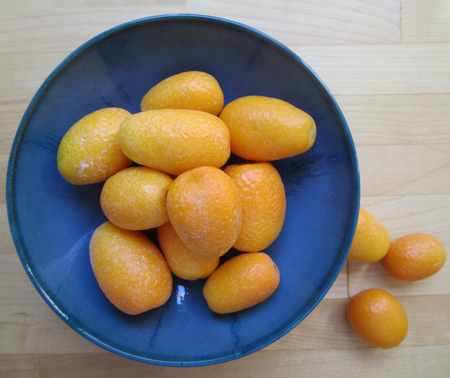 We actually are still getting kumquats, so I think you might be lucky at the stores! Welcome to you, too, Emily! If you get to make these, let me know what you think! I love your little lesson and I always classified them as citrus. They grow in Israel as ornamental trees among other citrus which makes me green with envy. Sometimes the fruit isn't even picked which is such a huge waste. I like the added rosemary in your candied recipe. Thanks, Shulie! Yes, we have neighbors who just let them rot on their trees and it breaks my heart. But sometimes there are just soooo many! What a lovely post, my mouth is watering. And I had to go and Google tangelo. I don't think they've made it as far as Hertfordshire. DM - I remember getting tangelos as a special Christmas treat when I was young. Always at the holidays, though. I guess it was my first lesson in seasonal eating! Clementines, too. And they will be perfectly ready for your holiday feasting! (Or for some good snacking this summer!) They also - maybe I mentioned this in the post - make a great cocktail garnish - Campari & Soda, etc. Thanks, Coby! I just saw Valentina's posting and am excited to try the jam once it is kumquat season here again! Thanks for stopping by!